There's no question that the Internet giants including Apple, Amazon, Google, Facebook, and Microsoft are having tremendous impact on the network equipment market today – in both direct and indirect ways. Heavy Reading estimates that, collectively, the Webscale Internet companies (WICs) spent about $27 billion on network equipment in 2016, or roughly 14 percent of global service provider capex during that year. To be clear, the bulk of Webscale equipment spending goes to servers, switches and other infrastructure that resides within the data center, but a sizeable (and growing) portion is dedicated to optical networking equipment used for connecting data centers together across geographies, including metro, long-haul and even submarine routes. This is the data center interconnect (DCI) market and opportunity. Originally, WICs bought the available telecom-purpose DWDM equipment and forced it to fit their unique application requirements. But the differences between traditional telecom transport requirements and Webscale transport requirements are stark. A sampling of these differences is highlighted in the excerpt below. Given their size and especially their growth trajectories, the WICs were able to steer DWDM vendor product development to meet their needs in a short time. By 2015, the first purpose-built DCI products – geared specifically for the WICs – were starting to arrive on the market. Even more significantly, however, the WICs' DWDM equipment requirements, which once were unique, are now beginning to be adopted by traditional telecom operators worldwide. In other words, DWDM equipment markets that were once separate and distinct are beginning to blend – and amazingly, it's the requirements of the upstart WICs that are becoming dominant. Examples include AT&T's Domain 2.0 initiative, as well as its Open ROADM MSA; the Facebook-initiated Telecom Infra Project (TIP); and Deutsche Telekom's Terastream initiative, among others. It is increasingly clear that the DWDM equipment suppliers that "get it right" with the WICs will also be best positioned to gain share in the new era of telecom operators. The impact of WICs on telecom infrastructure is a wide-ranging topic. Metro Data Center Interconnect Forecast & Analysis focuses on a subset of this infrastructure – the metro DCI market. The report forecasts the global DWDM opportunity for metro DCI from 2017-2021, including both the direct and indirect DCI equipment revenue opportunities. Forecasts are broken out by geographic region and by line rate. The report quantifies direct metro DCI DWDM revenue in 2016 and provides 2016 market share for vendors. Additionally, the report assesses metro DCI product specifications across suppliers and profiles all leading metro DCI equipment vendors. 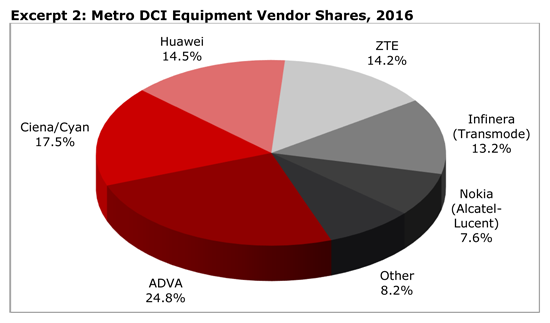 The market share data presented in this report reflects the direct DCI revenue contribution by Heavy Reading's definition. Most vendors do not currently break out from their broader metro WDM revenue the portion accounted for by metro DCI deployments. A few companies did provide Heavy Reading with some general guidance on their revenue from metro DCI. The excerpt below shows our metro DCI equipment vendor share estimates for 2016. Metro Data Center Interconnect Forecast & Analysis is published in PDF format.